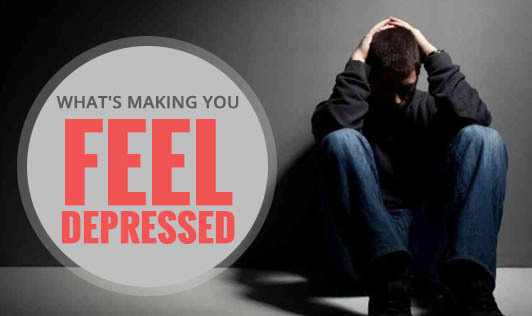 What's making you feel depressed? Lifestyle choices make a huge difference to your physical and mental health. People feel they are fundamentally flawed and often make plans to end things that don't improve. However, quite often, the root cause of their depression is not a biochemical imbalance or a life sentence. Rather, it's a result of one or more of their lifestyle choices. • Isolation: Social connection is one of the most proven ways to prevent and cure depression. Often, we feel we're no fun and nobody wants to spend time with us, leading us to isolating ourselves from others. One has to acknowledge that the thought does not serve him, and could cause him more harm. • Sleep deprivation: Tiredness affects mood, energy levels as well as cognitive functioning. Depression can cause sleep disturbances, so it can become a vicious cycle. Hence, it's important that you speak to your therapist about ensuring proper sleep, hygiene and learning behavioural cognitive strategies for managing insomnia. • Grieving: If you've experienced a major transition, such as lost your job, loss of a family member or pet, all of these situations are related to grief. Grief mimics depression, so feeling low, irritable, lack of interest in things you used to enjoy, unable to focus, and experiencing disturbances in your sleep and diet are related to your adjustment to the transition or loss. • Stress: Chronic stress can lead to depression. If you're unable to cut some of your responsibilities, consider assessing where the expectation you feel is coming from and take the pressure off. If you fail to do that, allow yourself to lower your expectations for performance, make mistakes or quit and ask for help. • Lack of exercise: Exercise is a variable that is greatly supported in its relationship to depression. You will notice a difference in your mood from doing 20 minutes of yoga or going for a walk after wok. • Poor diet: Research suggests that nutrient deficiencies are linked with depression. For instance, Vitamin B and D are negatively related with depressed mood. Hence, it's important to eat a well balanced diet. Lifestyle changes can be a little hard to make in the beginning but, with practice, they are the things you can do to make a positive difference in your life!